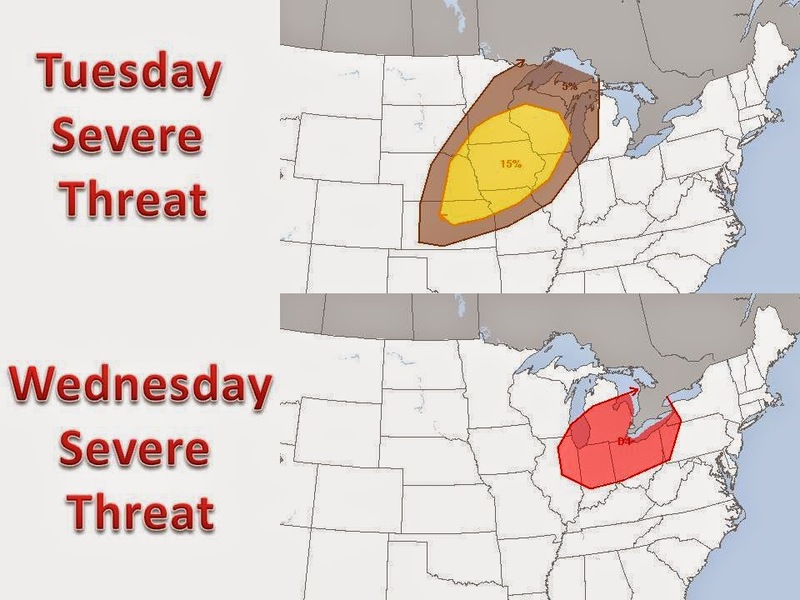 Midwest Winter Weather Blog: Severe Weather ---> Excessive Cold ----> Snow Flurries? Severe Weather ---> Excessive Cold ----> Snow Flurries? After a tranquil Sunday and relatively quiet Monday, the world of weather in the Midwest will become much more active by Tuesday. A developing area of low pressure will push through the Midwest early Tuesday and drift NE through Wednesday. East of the system a more humid and unstable airmass will encompass the shaded area. Severe T-storms should develop in and around the shaded areas. Damaging winds and large hail appear to be the primary threats. Flooding will also pose troublesome with much of the Midwest saturated from recent heavy rains. 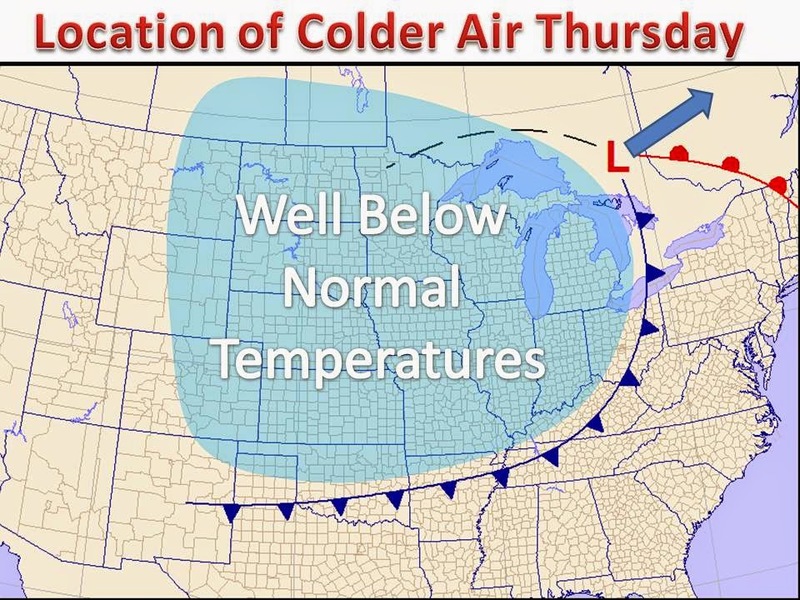 As the system pulls away Thursday, winds will shift out of the northwest and usher in the coldest air of the season. It will certainly feel like fall with a cool dry airmass in place. High temperatures on Friday will be running 15-20 degrees below normal across most of the central part of the country. Areas north of a line from Green Bay to Minneapolis to Rapid City could deal with some frost by the end of the week, or maybe even a hard freeze. Much of the Midwest will see highs in the 50s and 60s respectively. On the left is the latest 6-10 day temperature outlook from the Climate Prediction Center. It shows the likelihood of temperatures below the normal mean temperature during a specified time period. For those that follow these maps, dark shades of blue are extremely rare. In recent days the dark blues are appearing as frequently as the did earlier in the Spring during the winter that never seemed to end. Another prolonged period of even colder weather has popped up in the computer models. The European model has another strong cold front passing through early next week with accumulating snow in northern Minnesota, we will see how this one plays out in coming days. The WPC is forecasting high temperatures in the 50s for the NW half of the Midwest. Going conservative 5 days out, these highs could even be lower than depicted on the right. High pressure builds in for Thursday night and Friday night, which could set the stage for near record low temperatures during this time period. With it being the first major shot of cold air, we will closely watch how the models handle it to get a gauge on the rest of the summer and into Autumn for future forecasts.